For all your paving and concrete needs, call us at (732) 684-6440 now! Toms River, NJ is home to many great people. Among those people are the heart and soul that come together to create our family: All About Paving and Concrete. With over 20 years of industrial, residential and commercial experience, we work hard to provide the community with professional paving and concrete services. Our company is owner operated and fully licensed. The staff we employ are experienced and professional in all they do. 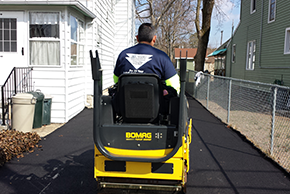 Commercial paving and sealcoating are services that we take seriously. Not only does the end result of our work reflect on us as a company, but also on the image of the respective commercial location. That's exactly why our crew treat every single job with the same professional attitude and take care to get the job done properly. This will always result in a high quality service provided to you at affordable prices. Just like you take great pride in the appearance of your home and yard, All About Paving and Concrete takes great pride in helping you create that great new look. Residential paving and sealcoating are services that we offer for your home. Services like creating driveways, sidewalks, Belgium blocks, paving stones for walkways, concrete patios and so much more! You can trust in our name because all of these services are provided by a brick paver specialist. Whether you own and operate a small business or a large industry location, our licensed crew is here to help. They can provide top notch professionalism when it comes to industrial paving and sealcoating. Asphalt paving is something we take great care in doing, as the end result is usually a parking lot or other high traffic area. No matter what your paving, sealcoating or masonry needs; All About Paving and Concrete can get the job done professionally at a fair price. Call today for free estimates!